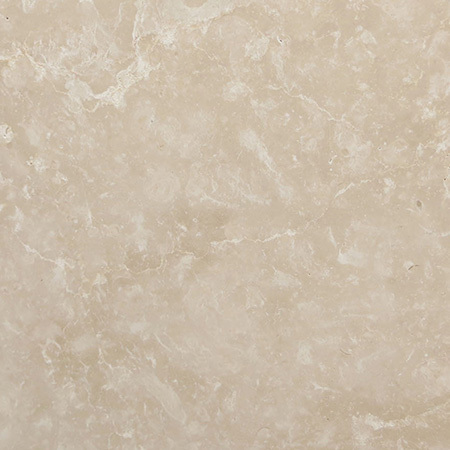 Using fragments of different colours, Caesarstone have built up a delicate, expressive stone. Unlike some of the brasher shades in our rainbow, ‘Red’ hints at colour without dominating the space. It’s a charming choice for a more neutral or pastel room. 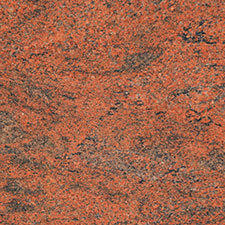 Like an expensive lipstick, ‘Rojoeros’ Silestone has an attractive intensity. 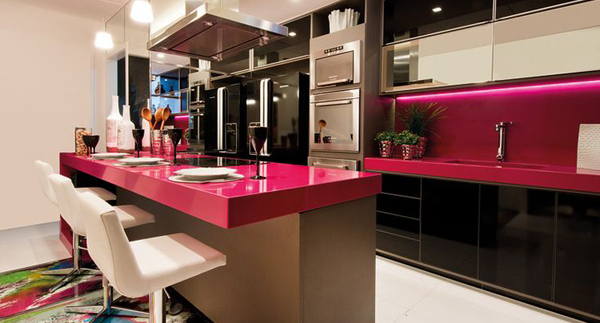 A deep colour, it works well with a matt or gloss finish and suits many different decorating styles. 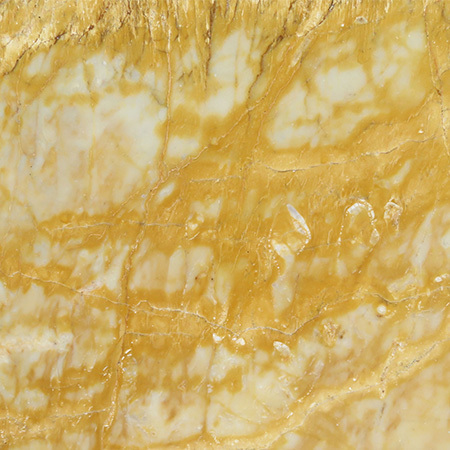 Like a burst of sunshine on a cloudy day, ‘Amarillo Gea’ Silestone will cheer up any room. 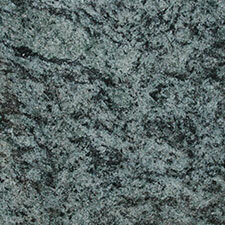 It’s a great choice for a statement kitchen worktop or splashback. At the other end of the scale, ‘Bahama Linen’ Samsung Radianz Quartz has a lovely, mellow look. 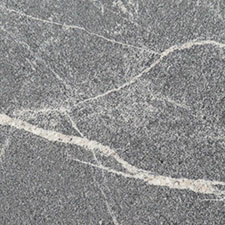 Small flecks of contrasting stone mimic the natural patterning of egg shell. The rich tones of ‘Sonora’ are reminiscent of aged terracotta or Mexican adobe houses. The colour brings the warmth and heat of the Mediterranean into your space, making it a great choice for adventurous chefs. By contrast, Silestone’s ‘Cool’ orange is such a bright, vivid shade that you could easily lose a piece of fruit on it. 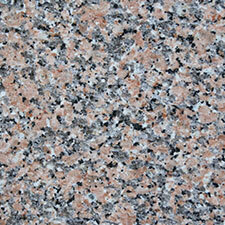 This vibrant colour is a dramatic choice that will dominate the design scheme. 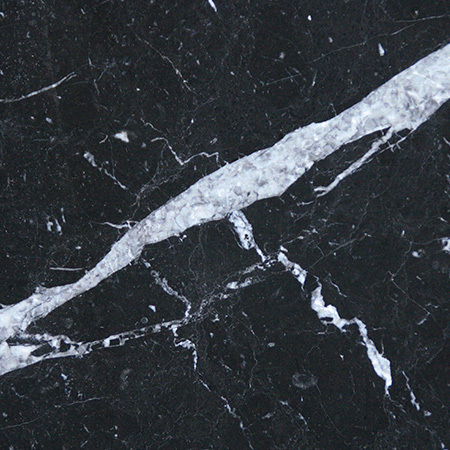 It’s ideal for a statement splashback or stone worktop. 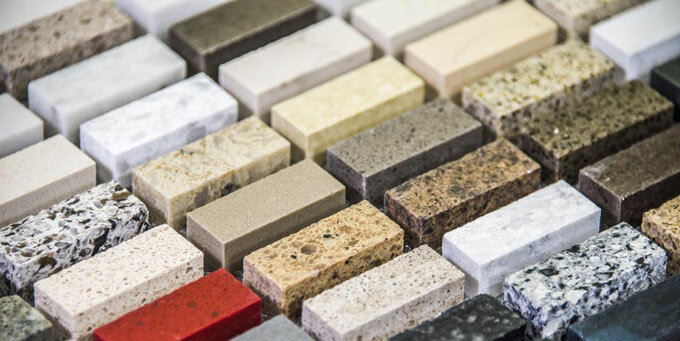 Silestone has some great greens, so it’s hard to pick just two. The classic, muted hues of ‘Green River’ are sure to strike a chord. 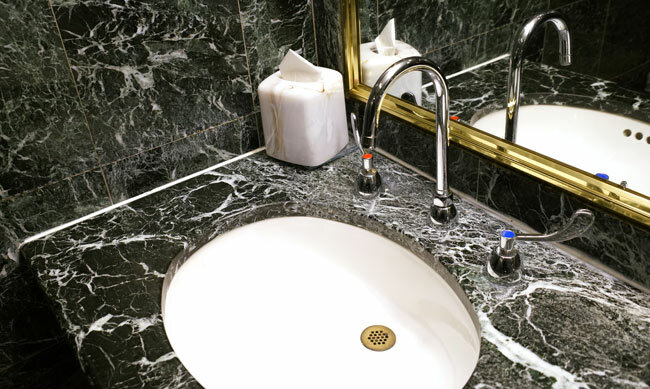 The colour is reminiscent of natural jade, making it a sophisticated choice ideal for a stylish bathroom. We love the contrast between ‘Green River’ and the bright lime ‘Fun’ colourway. It’s amazing that one collection of stones can have such variation, and yet it does. Lime can be a challenging colour, but it’s always fresh and zingy. It’s a great way to bring sunshine into your room without using yellow. 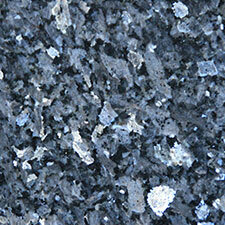 The bright California sea blue of ‘Blu Corallo’ Arena Stone looks lovely and fresh in any room. It looks stunning and summery all year round, particularly when paired with crisp white cabinets. It’s also ideal for adding to a nautical theme in the kitchen or bathroom. If you’re looking for a more traditional navy and white nautical look, or simply prefer something stronger and darker, ‘Azul Marina’ Silestone is an obvious choice. This intense colour provides an excellent backdrop for white china or modern chrome. The deep indigo of the sky after sunset, ‘Parigi Blu’ Arena Stone rounds out our rainbow. It’s an intense shade that’s best paired with lighter cupboards and floors. It’s sky-like depths make it well worth the effort. While we’re staring at the sky, we love the midnight depths and sparkling stars of ‘Blu Stelline’ Arena Stone. 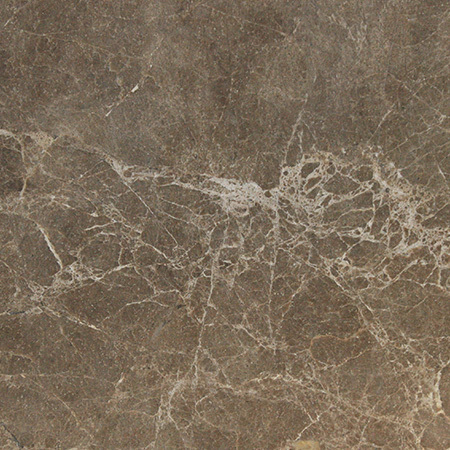 The bright quartz chips make this stone something really special, giving it an unusual glitz and glamour. 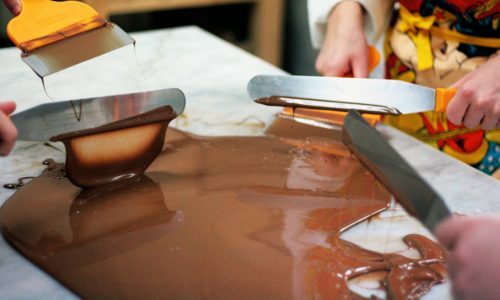 Why are marble worktops great for making chocolate? 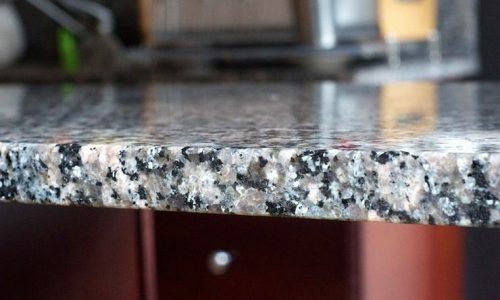 A love of chocolate has to be one of the more unusual reasons for choosing a marble worktop, but it’s a completely valid one. 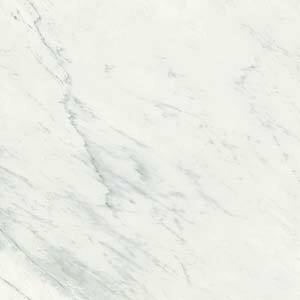 With Easter on its way, it’s the ideal time to try your hand at making home-made truffles, Easter eggs and other confectionery – and your marble worktop will definitely be an asset!